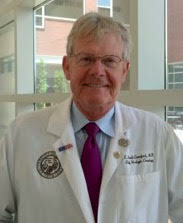 Researcher-physician E. David Crawford has devoted his career in medicine to educating the public about men’s health issues and finding effective techniques and procedures to address prostate cancer. A 1973 graduate of the Cincinnati College of Medicine, Crawford is a professor of surgery, professor of urology, professor of radiation oncology, and head of the section of urologic oncology at the University of Colorado Anschutz Medical Campus in Denver. An active clinician, researcher, and educator, Crawford has received more than 95 research grants advancing the diagnosis and treatment of prostate cancer, including metastatic and castration-resistant disease. In an effort to raise public awareness about prostate health, he founded the Prostate Conditions Education Council (PCEC) in 1989. This nonprofit is comprised of a consortium of leading physicians, health educators, scientists, and men’s health advocates. PCEC’s advocacy for free or low-cost prostate screening has affected the lives of millions of men. Crawford is also an active member of many national and international organizations, and his involvement in the national prostate cancer arena has been widely recognized. He is a member of Best Doctors of America and was named Healthcare Provider of the Year in the Denver Metro area by the Denver Business Journal. He has run in more than 20 Boston Marathons.